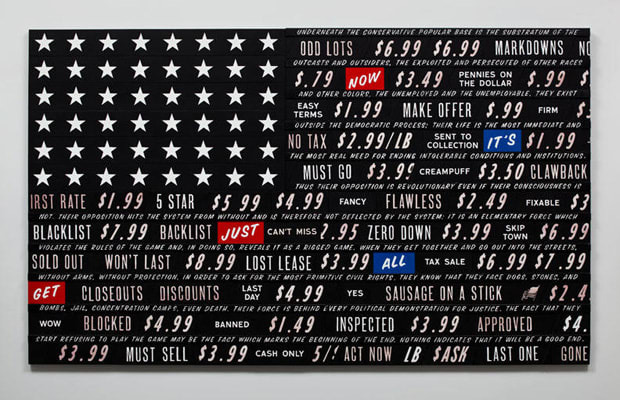 Skyler Fein's 2010 Black Flag painting is part of a group show at Omi International Art Center show in Ghent, New York titled Vote for Me and I’ll Set You Free. It features older work (such as an engraving of the Declaration of Independence) alongside contemporary pieces, all from the personal collection of MoMA trustee Lawrence B. Benenson and united by very strong political statements. Black Flag particularly expresses concerns over the economy and race as they relate to human value and suffering. Visit the exhibition through November 30, 2012, which also includes work by H. C. Westermann, Wes Lang, Antoni Muntadas, Viviane Sassen, and more.